The best way to keep your car performing like new. Regular maintenance is vital to maintaining the highest level of performance, safety, and reliability from your Volkswagen. Let the experts at Peninsula Automotive help you maintain your vehicle by staying on top of the recommended service. This will help to increase the life of your vehicle and deliver more dependable, economical performance. Follow our recommendations and you will enjoy maximum reliability and peace of mind from your Volkswagen for many years. Engine: Change the oil, clean the oil strainer, check for leaks. Battery: Check the electrolyte. If necessary, add distilled water. Clean and grease the terminals. Windshield washer: Check the fluid. V belt: Check the tension and condition. Ignition system: Check the dwell and timing with electronic equipment. Throttle positioner: Check for proper functioning (where applicable). Exhaust system: Check for damage. Manual transmission: Check the clutch pedal freeplay. Automatic Stick Shift: Check the freeplay clearance at the servo rod. Engine: Check the engine oil level. Driveshafts: Check the boots for leaks. Cars with torsion bar front axles: Check the dust seals and the ball joint plug (where applicable) for a proper fit. Cars with torsion bar front axles: Check for excessive ball joint play. Steering: Check the play. Check the tie rods and the dust seals on the tie rod ends. Brake system: Check for damage and leaks. Brake pedal: Check the pedal freeplay and the pedal travel (brake adjustment). Brake fluid: Check the level. Brake linings or pads: Check thicknesses. Tires (including spare): Check for wear and damage. Check and correct the pressure. Check the operation of the headlights, high beam indicator light, parking lights, side marker lights, license plate light, emergency flasher, stop lights, taillights, back-up lights, turn signals, horn, rear window defogger, and brake warning light. Windshield wipers: Check the operation. Windshield washer: Check the operation and the fluid level. Battery: Check the electrolyte level. Check the braking, clutch, steering, heating, ventilation system (including fresh air fan), and overall vehicle performance. Check the interior lights, the instrument lights, and – on 1973 and 1974 cars – the heater lever spot light. Check the warning lights for the generator and for oil pressure. Check the operation of the Automatic Stick Shift transmission (where applicable). Check the ATF level following the test drive. Engine: Change the oil. Clean the oil strainer. Valves: Check and adjust the clearance. Ignition distributor: Check and adjust the dwell angle and the timing. Engine idle: Check and, if necessary, adjust. Manual transmission: Check the oil level. Add oil if necessary. Automatic Stick Shift: Check the oil level. Add oil if necessary. Check the torque of the pan bolts. Front axle: Lubricate (1970 through 1972 cars with torsion bar front axles). Test drive as described earlier. Then check the cylinder head covers for leaks. Ignition distributor: Replace the breaker points. Then adjust the dwell angle and the timing. 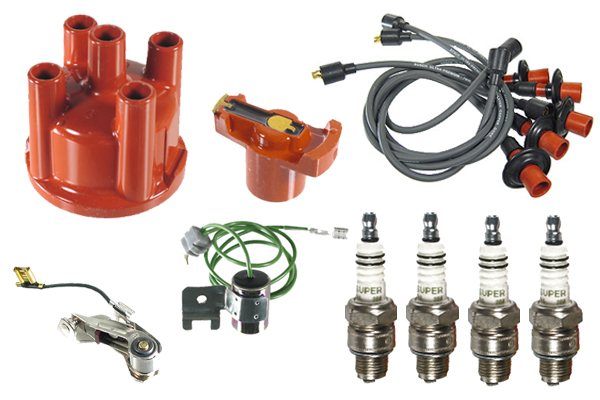 Ignition system: Visually check the distributor cap and rotor. Activated charcoal filter: Check visually.